This title in the acclaimed Blue Books of Neurology series highlights advances in epileptology and new ways of managing seizure disorders. Contributors from around the world—most new to this volume—lend a global perspective and provide the latest thinking on the new and controversial issues surrounding epilepsy. You’ll find detailed discussions of difficulties in diagnosing and treating epilepsy, including the latest pharmacologic management strategies. This book covers the entire range of issues in epilepsy from basic science research to current clinical issues to medical and surgical therapeutics. Find all you need on critical issues in treating epilepsy and seizure disorders. Provides the expertise of new contributors and volume editors who are world-class authorities in the field for authoritative guidance. 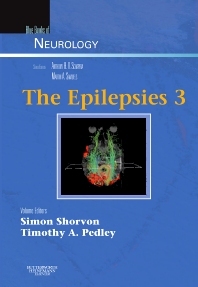 Features thoroughly updated content including new chapters—Seizure Prediction; Drug Resistance Genes; Cortical Myoclonus and Epilepsy; Sudden Unexplained Death in Epilepsy; Seizures in the Elderly; Rasmussen’s Encephalitis; Epilepsies Due to Monogenic Disorders of Metabolism; Epilepsy and Sleep; Long-term Effects of Seizures on Brain Structure and Function; Brain Stimulation in Epilepsy—for the most current information for use in the decision-making process. Includes coverage of the surgical management of epilepsy to help you determine when it’s best to recommend surgery and for which patients. Emphasizes pharmacologic management of seizure patients that reflects advances in biotechnology and imaging.